From nursing stations to new work schedules, these women are making moves. Only two countries in the world do not have a paid family leave policy, the United States and Papua New Guinea, according to the International Labour Organization. Of the women in the U.S. who take 12 weeks of leave after giving birth, only 15 percent get paid, according to the U.S. Bureau of Labor Statistics (BLS). With U.S. governmental policy lagging behind, female entrepreneurs are taking action. In some cases, women are creating solutions to barriers they have experienced balancing motherhood and work. Other women are founding businesses based on what they hear from mothers at the office or at the playground. 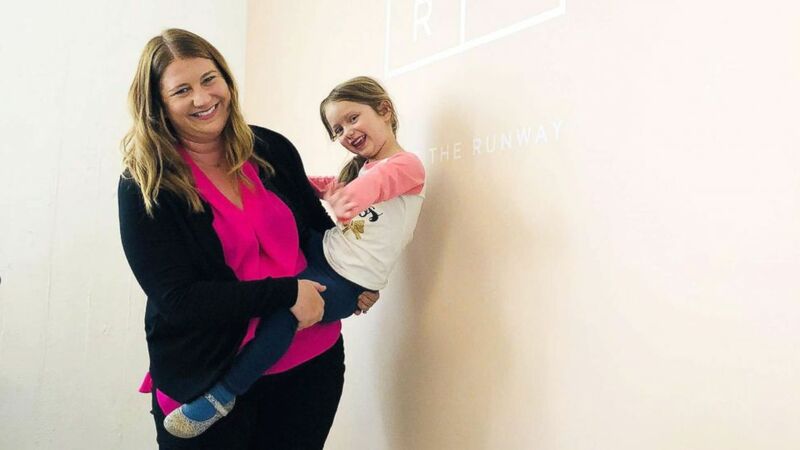 These six moms are staging a workplace revolution. Stephanie Conduff was a new mom on her way to becoming a lawyer when a janitor walked in on her while she was pumping in a side room at her law school's library. The embarrassing encounter changed Conduff's career trajectory. (Courtesy Leche Lounge ) Stephanie Conduff poses with her daughter, Emerson Pearl, 4, who inspired her to found Leche Lounge. After spending a few years at a law firm, Conduff, now a mom of two, left law to became an entrepreneur. She is the founder and CEO of Leche Lounge, which provides companies with portable suites for pumping and nursing mothers. "Unless you have a personal experience, it’s really hard to solve the problem," Conduff said. "I had a really intimate personal experience and now am solving a problem for women who may not have a voice otherwise." Each Leche Lactation suite comes equipped with a hospital-grade breast pump that allows moms to express milk faster. The suites also include features like a USB charger, fan, seating and a mirror to readjust clothing. (Leche Lounge) Stephanie Conduff stands inside a Leche Lactation suite two weeks after giving birth to her son. The units are also stocked with cleaning wipes and calming lavender wipes [lots of wipes] and refrigerators, upon request, to give moms a place to store their milk. "A lot of women are afraid they may lose their jobs or get a shift they don’t want and they don’t want to be rabbke-rousers in the workplace," Conduff said. "Leche Lounge is able to come in and provide a solution and it no longer makes it adversarial for working women." 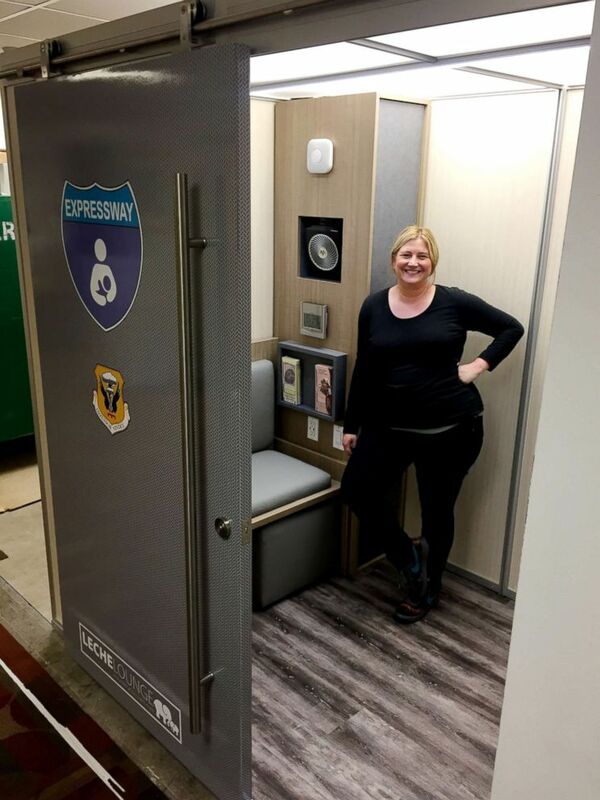 Since founding the Oklahoma-based company in 2016, Conduff has focused on bringing Leche Lactation suites to workplaces like manufacturing sites, casinos, airports and call centers that are less conducive to offering women a permanent private space. "There are women working in all industries, and a lot of women don’t have office doors to close," she said, noting that much of her work is educating male business leaders. "It’s been mostly sales to men about a women’s issue." (Leche Lounge) Stephanie Conduff sits inside a Leche Lactation suite with her son, Guthrie. Employers have been required to provide “reasonable break time” and a place, other than a bathroom, for employees to pump breast milk since enactment of the Affordable Care Act in 2010. Around 3 million women per year return to work while they are breastfeeding and pumping, according to Conduff. "If the future is female, we’re going to have to do things to keep these women in the workforce and focus on what matters, which is not running out to your car or trying to create food for your child in the bathroom," she said. Jenny Galluzzo, now a mom of two, realized after her first son was born that her career as a journalist was not the career she wanted as a mom. Gina Hadley, also a mother of two, found herself at a career roadblock after crisscrossing the country for her husband's job. 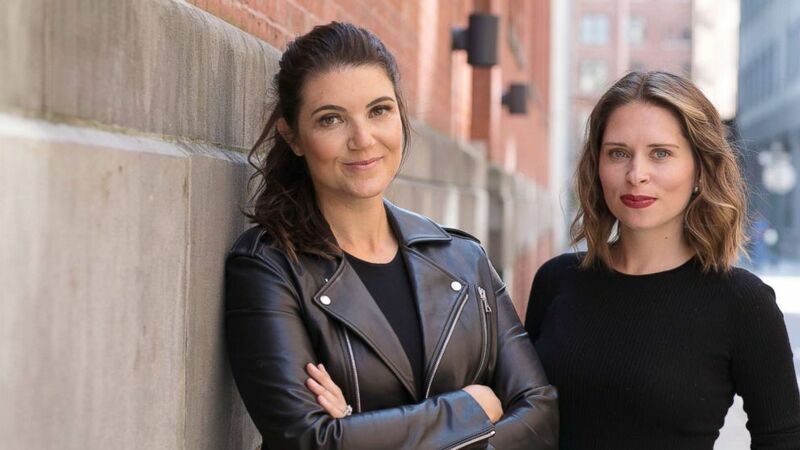 Together, the two friends co-founded The Second Shift, a New York-based company that matches women with in-demand skills with companies that need temporary or project-based help. (The Second Shift) Jenny Galluzzo, left, and Gina Hadley are co-founders of The Second Shift. "We built the business that we needed for our own lives and our own careers," said Galluzzo. "It’s not a binary, on-off switch between working and not working any longer because we’re the solution for that problem for women." The Second Shift now counts more than 1,500 women as members. It provides opportunities for women across the U.S. with 10-plus years of experience in the fields of marketing, finance, web design, human resources and legal. Women are placed in opportunities that range in scope from a three-week analytics project to a nine-month stint as an interim chief marketing officer, according to Hadley. Some opportunities allow women to work remotely, while others are office-based. The Second Shift members are also matched with job opportunities based on their skills, not the last job title they held. "We just kept talking to other women [who] had spent their entire lives building careers and then it’s just this one moment [where they step away from work] that could actually be a go-no-go in their career," she said. "There are so many reasons why women take leave, and it’s not just children." Hadley and Galluzzo say The Second Shift's skills-based approach is exposing more companies and industries to women in senior positions. Williams, 36, was ranked number one in the world when started her leave. Instead of a toy for the baby, some coworkers are giving new moms vacation time. This can be your summer to lean into your side hustle. That is particularly true in tech, an industry known for offering generous paid leave programs for new moms and dads. The San Francisco region is one of the busiest for The Second Shift, according to Galluzzo and Hadley. "For employers, not only do they get the benefits of these experts, for a lot of them they continue to bring in senior women in places where senior women may not have sat before," said Galluzzo. "You may get senior women sitting in the chair of someone who is going out on paternity leave in which a women has never sat there before." Just as Hadley and Galluzzo started their company through their conversations with other women, The Second Shift continues to expand and become known in cities beyond New York and San Francisco thanks to women. "Women are really good at connecting with each other and women are really good at supporting each other and spreading the word," Galluzzo said. Annie Dean, the 32-year-old co-founder of Werk, saw after the birth of her first child, now 5, that the standard workday was holding her back as a working mom. "I felt like there was a way to work smarter," said Dean, recalling the long hours spent at her desk as a Wall Street corporate attorney. Dean, now a mother of two, partnered with Anna Auerbach, mother of a 5-year-old son and former COO of a community-building and advising firm, to disrupt the workplace and create flexibility for women. (Werk) Anna Auerbach, left, and Annie Dean are the founders of Werk are seen here in this undated file photo. "We did research and found that the structure of the workday was a key factor why women were not reaching the top," Dean said. "The idea that gender equity is not possible in our lifetime is silly. It just means we to have to adjust the workplace structure to be more inclusive." The result of Dean and Auerbach's collaboration is a startup, Werk, now focused on changing the workplace for both women and men. "What we recognize now is that flexibility is a way to do our jobs better and have more meaningful lives," Dean said. "It marginalizes the conversation if we just talk about women and caregivers. We really should be talking about how to make all people work better." Werk gives companies a scientific way -- through data and research -- to see how valuable flexibility is to their business and how it can influence everything from employee retention and burnout to real estate costs, according to Dean. Flexible work options include working remotely, the opportunity to have an unconventional schedule, less travel, reduced hours and the ability to step away from the job in what Dean calls "micro increments." "We would receive hundreds of emails per month with women sharing their personal stories about why this is such a needed thing to take on," Dean said. "Our North Star will always be helping the women who were just like us in our roles and helping to advance those women in leadership roles." 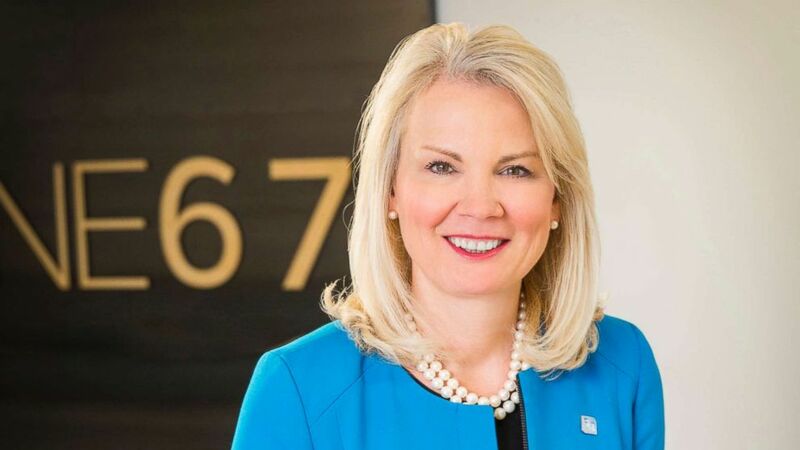 Teresa Tanner is one of two women among the 13 executive officers of Fifth Third Bank, a national bank headquartered in Cincinnati. 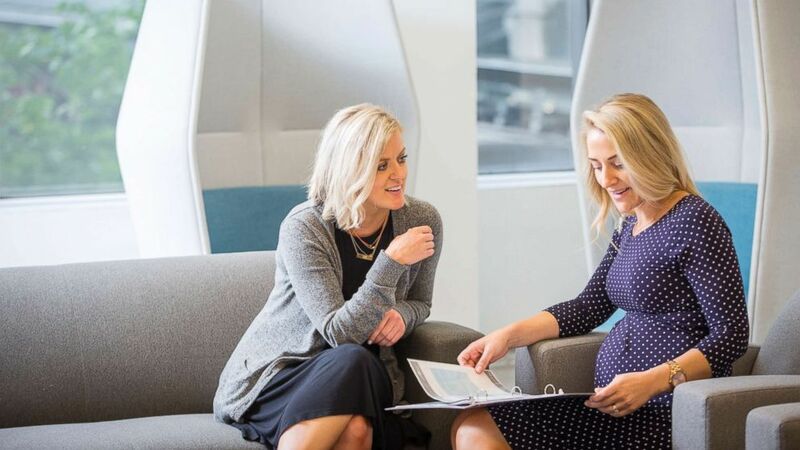 Last year, Tanner, the bank’s chief administrative officer, launched a maternity concierge program for employees from the time they are pregnant to when their child turns 1. (Fifth Third Bank) Teresa Tanner, Fifth Third Bank's Chief Administrative Officer, created the Maternity Concierge program. The free program -- available to all of the bank’s 18,000 employees, 60 percent of whom are female -- offers nearly any service a mother could want, from grocery shopping to finding the best breast pump. In addition to responding to requests, the concierges also reach out to pregnant employees to make sure they are on track with doctor appointments and preparing for the baby. "They sat down with me and said, 'Here are the things women typically need at six months [pregnant], nine months and birth. What have you planned for and what can we take off your plate?'" Grossman recalled. (Fifth Third Bank) Charnella Grossman, a portfolio manager for Fifth Third, with her daughters, Kenna, 2 and Elise, 11 months. Grossman points to the position of Tanner, a mother of two, in the boardroom as the momentum for change. "She is a mother and she is sharing some of her experiences and helping our old institution evolve with changing needs," Grossman said. "What they’ve really done is help create a family-friendly culture that shows the bank is prioritizing working moms." Women who enrolled in the maternity concierge program were almost 25 percent more likely to remain at the bank six months after returning from maternity leave than women who didn’t use the program, according to Fifth Third. (Fifth Third Bank) Maternity Concierge Jessica Hanson works with Fifth Third Human Resources Business Partner Jen Brown to discuss nursery theme ideas. Since the launch of the service, Fifth Third has also made available four weeks of bonding time for new parents (birth, adoptive or foster) and now pays for the shipping of breast milk during work travel.